With a young, first-year head coach and an underdog mentality, Murray State is a fun little story. Undefeated and ranked in the top-15, it�s hard to find anybody who resents the Racers� success. But there�s a reason Murray State hasn�t climbed the rankings even further, despite the fact that top-ranked Syracuse is the only other team in college basketball without a loss. It�s because people don�t believe in the Racers. At all. They look at their non-conference schedule�which did not include a major-conference opponent�and laugh. They look at the Ohio Valley Conference and laugh, too. And they point to Murray State�s three consecutive single-digit wins in the OVC and argue that Steve Prohm�s team has become exposed. 1. Murray State has beaten more people than you think. Forget the fact that it hasn�t played anyone from a BCS league. In an age where the Pac-12 is essentially a mid-major, conference affiliation means less than it ever has in college basketball. The Racers have not played an especially challenging schedule, but they own better road and neutral victories than several top-25 squads. They won the Great Alaska Shootout, for example, knocking off Southern Miss in the process. Larry Eustachy�s program isn�t a name brand, but the Golden Eagles are 14-3 and in the top-20 of the RPI ratings. More impressively, Murray State won at Memphis, which may be struggling but still is favored to win the C-USA. That�s two wins against the cream of the crop of that league, and Murray State also slapped around Dayton at home, winning by 17 points. That same team beat Minnesota, Alabama, Mississippi, Saint Louis and Temple this season and should figure into an at-large berth in March. 2. We can�t penalize them for struggling to beat OVC teams, especially without Ivan Aska. That�s a very narrow-minded way to look at the world. Basketball isn�t always predictable, and it can�t be quantified with mathematical formulas or the transitive property. Lately, Murray State has struggled in wins against Jacksonville State, Tennessee Tech and Morehead State. I�m not going to argue that those are good basketball teams, but we�re talking about league play here. It�s nearly impossible to dominate a conference, since every team you play knows your game plan back and forth. The Racers can�t intimidate anybody in conference play�everybody has already seen them before. And remember, forward Ivan Aska is out with a broken hand right now. How many teams excel without their best big man in the lineup? 3. Just watch them: Murray State is a very good team. The eye test�that�s what we hear about from the likes of Jay Bilas all season. Use it. Murray State can ball. Isaiah Canaan just might be the best point guard in America, and he�s a heart-and-soul type leader who can rally a team. Canaan has a bulldog�s mentality and hardly ever forces a bad shot, and even with his star status he finds a way to get his teammates involved. 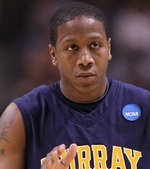 Most of the Racers wouldn�t crack the starting lineup at other big-time programs, but Canaan would. And his presence helps his teammates rise above their potential. Even without Aska, Canaan isn�t the only option on Prohm�s team. This team can really shoot the ball, including Donte Poole, a senior who�s enjoying a breakout season with more playing time. Murray State is also an extremely efficient offensive team, helped by forward Ed Daniel (60 percent from the field) and Jewuan Long, both of whom have started every game. The Racers run their offense to perfection, and things will only get better when Aska returns. Murray State will not face a post-season opponent for the remainder of the regular season, so it will have no chance to prove itself until the NCAA Tournament begins. Give this team a chance, though. Watch the Racers play for five minutes, and you�ll understand why it could finish near the top of most BCS conferences.